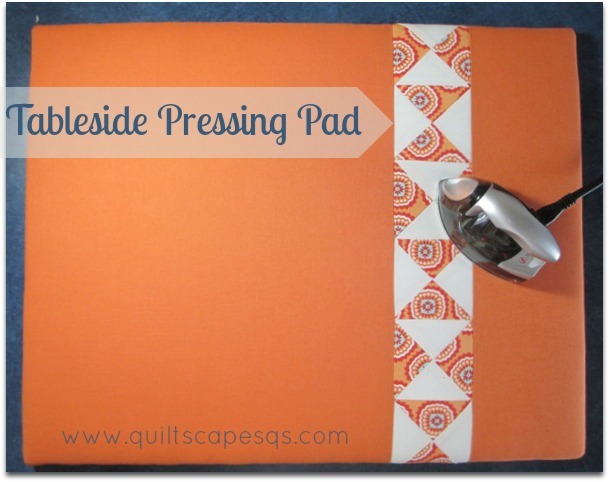 Let's make a customized mini pressing pad to keep next to the sewing machine! plus a little Avignon by Emily Taylor for Riley Blake Designs. 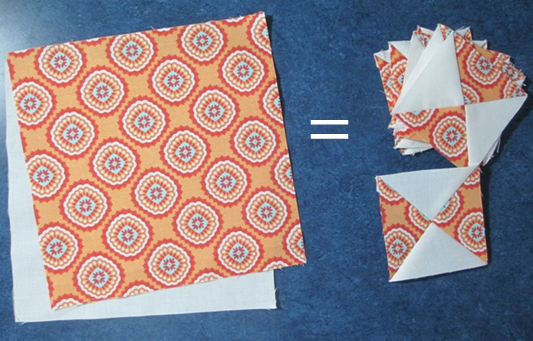 from this recent VIDEO (Sewing Triangles) I thought we could use them! to make EIGHT Quarter-Square (Hourglass) blocks at the same time! Square up the blocks to 3"
Next, alternate each unit and stitch them together in a row. Slice your fat quarter at about 14" over from one edge. using 1/4" seam allowances. Trim to 18" x 22" rectangle. or turn under 1/4 inch and stitch. Trim off batting corners, about 3/8" from the corner of the wood. and staple or tack to the wood. Pull tightly and staple your fabric to the back of the plywood. and filled in with staples all the way around to secure. I used a light piece of fusible interfacing and just ironed it on! This is just another fun "Snippet" from my sewing room to yours. Great for classes or retreats, too! This little pressing pad could be made with a coordinating strip of fabric, or even without blocks. I thought it was a fun way to use up these extras. Plus, they coordinate with a sewing kit ensemble I'm putting together... Shhhh, don't tell, it's a surprise! See more simple project tutorials, gift ideas and handmade doo-dads for the sewing room on my Snippets page!